What If We Are Worse Than Herod? Christ before Herod / Paint. - Duccio di Buoninsegna , v. 1255-1319. The Gospel according to St. Luke is remarkable for its depth of detail and literary liveliness. More than any other Evangelist, Luke takes the time to lovingly decorate the scenes in which his vibrant characters play out the drama of Christ’s life, teachings, death, and resurrection. Luke’s richness of detail is a hallmark of his entire text, but it comes to the fore most of all in his description of the events taking place in Jerusalem shortly before the crucifixion of Jesus. One striking element of Luke’s narrative is his description of Christ’s encounter with Herod from Chapter 23 (printed above), and which is not mentioned by the other Evangelists. According to Luke, after Christ’s arrest Pontius Pilate, caught in a jurisdictional grey-area which would have been quite common in First Century Judea, sends him to speak with Herod in the hope that he would no longer have to deal with the strange prophet who had so angered the people. The meeting between Jesus and Herod takes place as noted above, and Jesus is eventually sent back to Pilate with whom, Luke reports, Herod begins to develop a friendship. It is easy enough to see the small details of this encounter as simply enriching the story of Jesus’ suffering, and they certainly do so. But this short passage may well contain a hidden lesson for us today, particularly those many of us in the North American Church who, much like Herod, enjoy comfortable lives in one of the richest societies in history. Herod’s attitude towards Jesus begins to strike a chord when we pause for a moment and compare ourselves to the ancient client king. In order to do this, we must break down Herod’s reaction to Jesus after he has received the man from Pilate. Luke reports that Herod was, at first, eager to meet Jesus, having heard many rumors about the prophet making waves in Galilee and Jerusalem. Herod’s hope, it seems, is for Jesus to perform some sign or miracle. He has a genuine interest in Jesus, and is entirely open to the possibility that he really can live up to the hype. This initial reaction may strike us as somewhat surprising. This King Herod is, of course, the namesake of the villainous leader reported by St. Matthew to have ordered the murder of thousands of infants shortly after Jesus’ birth. (Mt. 2:16). He will, we already know, eventually mock Jesus and return him to Pilate and certain death. Yet, as his encounter with Jesus begins, he shows distinct interest in the supposed messiah, and remains open to the possibility that Jesus will, in fact, be able to back up the claims being made by his followers. Herod, in a shallow sense, wants to believe Jesus, and his hope is that Jesus will satisfy this desire through outward signs. Jesus’ arrival, however, brings something else for Herod. Placed at the king’s feet, Jesus is faced with direct questions from him, as Herod sits in judgment with Jesus’ life in his hands. We may be assured that among Herod’s questions were included his demands to see a miracle – an earthly sign which he thought would stand as proof of Jesus’ status as prophet or Christ. Jesus’ reaction, however, is to remain entirely silent. 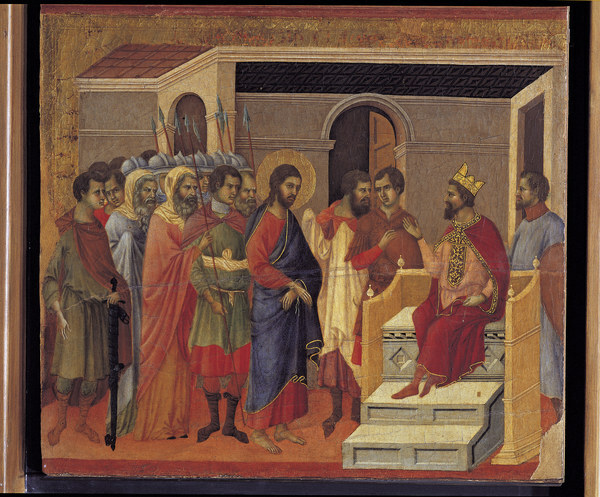 Frustrated, Herod begins to mock him, with his advisors pitching in, and returns him to Pilate decked out in royal clothing. After this we may assume that Herod dismissed Jesus from his mind. He waived his jurisdictional privilege to charge such a petty criminal and metaphorically washed his hands of the man in just the way that Pilate would literally do soon after. For Herod, Jesus had turned out to be nothing special – just one more of the many new religious leaders of the area mentioned by Luke in the Acts of the Apostles (5:33-39). Herod moved on with his life, to focus more directly on the political turmoil of Judea and the erosion of his own power which would soon lead to direct Roman imperial rule of the province. It is easy to simply scoff at Herod as one of the great villains of the Gospel. Like Judas, Pilate and the people of Jerusalem, we may simply chalk him up as conspirator to the murder of Jesus. But it is important not to be too arrogant when assessing Herod’s actions. 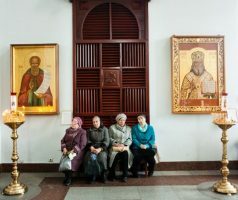 Indeed, when we take a moment to consider them, it is easy to see how often we as Orthodox Christians fall into an identical attitude. If we have grown up in North America, we have heard of Jesus Christ from the very beginning of our lives. Whether raised Orthodox, heterodox, non-Christian or atheist, we, like everyone in our society, have met the news of Christ in much the same way as Herod: with curiosity. Can what is said about this ancient man possibly be true? 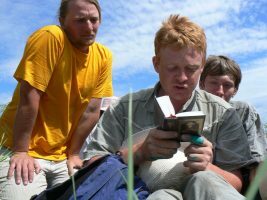 We have wondered to ourselves at the supposed miracles, thumbed through the scriptures, visited churches and spoken with friends and family. Just like Herod, our relationship with Jesus began through hearsay followed up by curiosity. But what follows this initial curiosity is the issue of concern here. Exactly how have we reacted to what we have heard of Jesus? For most reading this magazine, the broad answer is that we have embraced Him and chosen to follow the teachings of His Church. But our reaction to Christ is more than a broad life choice – it is also something established from day to day and moment to moment. And here, in the immediate present, we find our selves, more often than not, adopting Herod’s attitude. Do we Orthodox Christians not do this every day to Our Savior? 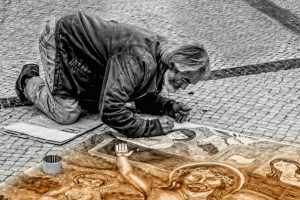 Though we have heard of his signs and wonders, his power to transform lives, his image shining through in the eyes of the living saints, do we not daily send him on his way with feigned kindness? Do we not demand of him signs which we wish to see and miracles for our own benefit just as Herod did? Do we not demand that things turn out the way we want them to, thereby placing Christ at our feet instead of sitting beneath his? Do we not demand that his wisdom conform to our understanding rather than conforming ourselves to Him? Do we not adorn him in beautiful garments without adorning ourselves in the garment of humility? Indeed, even we who have embraced Jesus Christ in our lives do this day after day. Having heard of Jesus Christ we approach him, at first, with interest. We pay lip service to his salvation, believing nominally in His Name. But, powerful and successful as we are, we daily get the next step wrong: we place Christ at our feet, and not the other way around. We give a nod to his power, we treat people nicely, we make donations to our parish, and come to liturgy now and then. Yet, by the end of the day we allow ourselves to be distracted by our businesses, our jobs, our finances. We gossip about our co-workers, fight about the housework, grow angry about politics. And, in doing so, we build ourselves up, seeking after earthly benefits, reveling in praise and success – placing ourselves in the seat of power as though we are kings and queens of our own lives. And we expect that God will serve these lives, praying for our own will rather than His, begging for benefits from Christ instead of seeking to benefit Him. We know, just as Herod did, that there is something about this Jesus which is worthy of worship – but it is a rare day that we come down from our thrones to sit at his feet. And just as Herod did, when we live like this we discover a Christ who is remarkably silent in our lives. And instead of seeing the depth of Truth in this silence, we take it for foolishness, and proceed with ourselves as though it is Christ who is deficient. It is Herod’s belief, not his unbelief, which ought to be a lesson to us. Herod begins in the right place, but he remains seated on his throne, and, with his vision clouded by this power, tosses Christ away wearing a beautiful coat. In just the same way, if our faith does not lead us to absolute humility, we robe Christ in a garment which serves not to glorify his name, but to condemn our own ignorance. If, then, Christ is silent in our prosperous lives, let us do what Herod failed to do: let us set aside for a moment our busyness, self-importance and even our own good works, and take the time to sit at his feet through prayer and cultivate humility in our hearts. If we do so we will discover indeed that it is He who is worthy to speak to us on His own terms, even when we do not understand. We will discover that His silence is, most often, His wisdom. We will discover that it is He who is the King of our lives, even if we attempt to place ourselves in that position. We will discover that it is the humility of our hearts which allows us to see His miracles, and that they will remain invisible if we do not approach them with faith. And, ultimately, we will discover that it is He who is worthy to place a garment of purple on our shoulders, and not the other way around.